The Mid-Market Rate. It’s the only fair exchange rate. Exchange rates don't need to be complicated. In fact, there's only one that you ever need to care about: the mid-market rate. The mid-market rate is an exchange rate unlike any other. It's the real one. In the world's currency markets, traders define the rates at which they are willing to "buy" or "sell" a specific currency. The mid-market rate is simply the midpoint between demand and supply for a currency, and because of that, it changes all the time. But that's as technical as you need to get. The most important thing to know is that the mid-market rate is considered the fairest exchange rate possible. The mid-market rate isn't a secret either. Its the rate you will find on independent sources such as Google, XE and Yahoo Finance. Doesn't everyone use this rate? Banks and money transfer providers do use this rate, usually when they trade between themselves. Unfortunately it's not the rate they pass onto you. It's one of the ways they can hide the true amount they're charging. Misleading pricing - You'll see an offer for a '0% fee', 'zero commission' or 'our best rates'*. A set 'day rate' - Most providers take the mid-market rate, and apply a margin on top, without being transparent. So you have no idea how much they're over charging you by. An unfair deal on your currency - By hiding the real charge in the exchange rate offered, most providers make huge profits at your expense, and you're none the wiser. Well, if you've ever sent money abroad, or converted your currency at an airport, then you've been unfairly overcharged. Since the real charge is hidden in the rate, most providers can charge prices that no one would accept otherwise. So without you even knowing, you got secretly charged €60. That’s just not right. Before you make a money transfer, or need to convert currency, make sure you check the real mid-market rate. And don't settle for any exchange rate that isn't the real one. 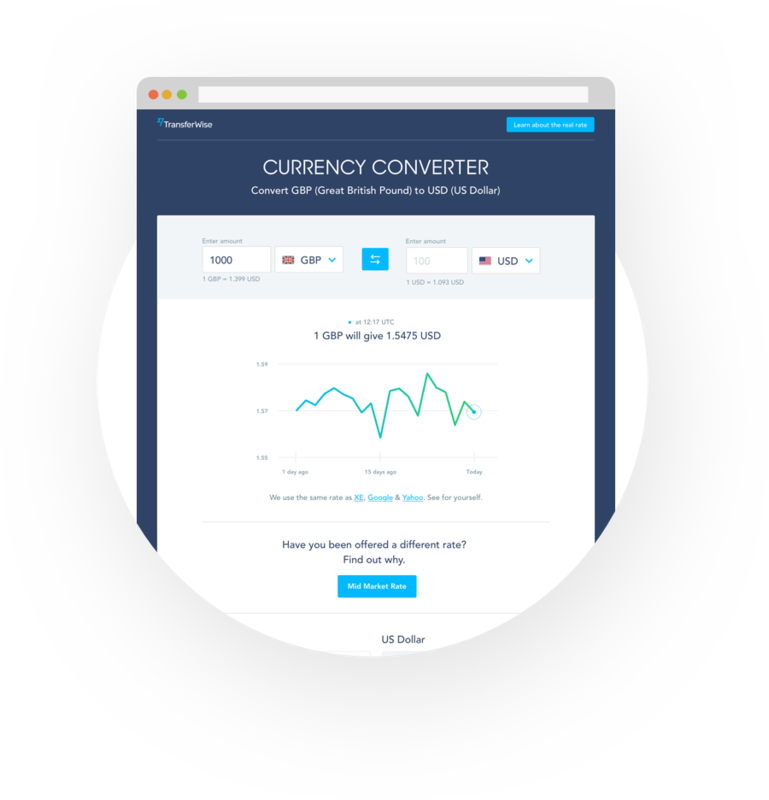 We’ve built the TransferWise Currency Converter to let you easily follow the mid-market rate, and how it's changed over the last 30 days. Try it for yourself, and never overpay again. But don't just take our word for it. You can check Google, Xe or Yahoo Finance, they all use the same real rate. TransferWise is different. TransferWise was founded on the principle that people deserve transparency, fairness and better value when it comes to their money. We're working hard to bring a fairer choice to people across the world, and to raise awareness about the hidden charges in the finance industry. Word is spreading fast, which means people everywhere are keeping more of their hard earned money.